Welcome back to episode 2 of Conversations with Convertus! In our first episode, we defined Search Engine Optimization (SEO) and Search Engine Marketing (SEM). As mentioned, here at Convertus, we use Organic Search interchangeably with SEO, and Paid Search with SEM. Over the next few videos, we’re going to be releasing some “what is” or “what are” videos, diving deep into both Organic Search and Paid search. We aim to clear up these complex digital solutions to help improve your dealership’s digital strategy, generate more web traffic and help get rid of that inventory! We’re going to start off by wading into the intricacies of Organic Search. Organic Search can be divided into two broad categories: on-page and off-page optimization. We’ll dive into the details of off-site optimization in future videos, but to provide a very high-level description right now: off-page optimization involves any measures taken outside of the website itself that impact its organic rankings. In today’s video, we’ll be highlighting a number of significant aspects of on-page SEO. On-page SEO is generally what we think of when we think SEO. It entails optimizing individual pages on a website to rank higher, increase CTR and gain more relevant web traffic. Some strategies for on-page SEO include the use of HTML tags (often referred to as H1/H2/H3 etc. headers), structural changes, increasing page speed, using alt attributes, writing enticing website copy, internal linking, and continuously creating original, relevant content, among many other aspects. So let’s dive into a few of the most significant aspects of on-page optimization! H1 tags are pieces of HTML code that help the search engine identify the outline and content of a page. 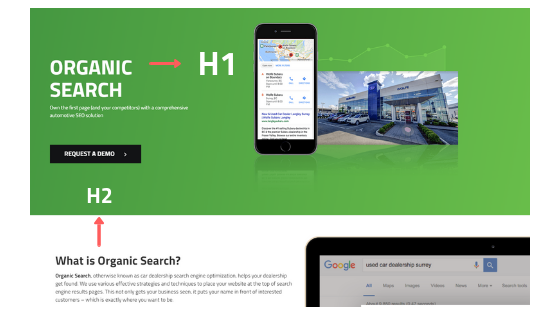 Simply put, H1 tags help Google understand what the page is about and what is important. → H1 is the title at the very top of the page and should contain your main keyword. → H2 are prominent sub-categories on the page that generally break down the content. → H3 are sub-headings that generally lie underneath H2 tags to highlight alternate key points. There are up to 6 headline tags but H3-H6 are generally not used often but they can be used as needed. Search engines only index text, so we use alt tags to describe the images for the search engine. An ALT attribute or ALT tag is a label or title given to an image on a web page and is written in HTML code. It is useful for Google because it may sometimes need help pulling the context of an image, if the image is broken or corrupted. That way, you at least have the description of what the image is! They are also very useful for individuals that are visually impaired, as Google can read out to the user what the image is. Read more about why ALT attributes are important and how to do them in Moz’s article. Tip: Include keywords in your image ALT tags to notify the search engine that your images are relevant to the content! We actually have a whole blog post about page speed because it’s an extremely important part of SEO and significantly impacts bounce rate and website traffic. Page speed is, well you guessed it, the speed at which your website loads. There are a tonne of different factors that contribute to page speed, often its related to the content on the page. For example, if you have large images that aren’t compressed or a large amount of coding that will slow the page down significantly. 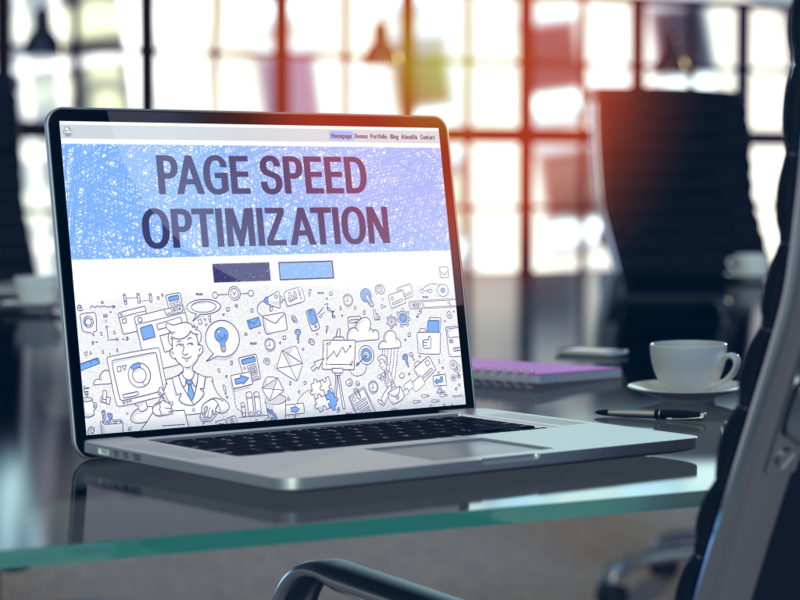 You want to maximize your page speed as much as possible to lower your load time. Load time is correlated with bounce rate; as load time increases, bounce rate increases, and of course, as load time decreases, bounce rate decreases. Akamai and Gomez.com conducted surveys which illustrated that 40% of users tend to leave a site that hasn’t loaded in 3 seconds. You can read more about that here. Since Google wants you to keep using their search engine, they want to provide you with exactly what you’re looking for in a timely manner. That’s why page speed is taken into consideration when deeming a website as a quality one for them to recommend. If your page speed is too slow, well “you snooze you lose,” says Google. It will likely lower your position in the search engine results page. Check out our blog to learn tips on how to increase your page speed! User experience (UX) is a broad term which denotes a user’s interaction with your website and how easy it is for them to reach their goals. It is quite an expansive topic that encompasses many different aspects, so we’re going to briefly touch on it. Essentially, anything that a user sees and interacts with on your website is something that can impact their experience, either positively or negatively. Page speed, website copy and website structure are all elements of user experience. Ideally, you want to offer simple, effective and human-centered on-page experiences and designs. Improving user experience by making your website easily navigable, eliminating frustrations and creating valuable content relevant to a user’s search query will have online car shoppers reaching out to your store, or returning to your website when they’re ready to take action. Since Google has the ability to track every click with Chrome user data, it can track what pages a user is clicking to determine whether they get lost in the sauce on your website, how quickly they bounce or how long they stay. Google gathers this information to decide whether your website has good user experience and will adjust your websites organic ranking accordingly. What is internal linking you may ask? This is a huge part of organic search and web page rankings. Simply put, it’s any link on a website that leads to another page or section of that same website. You know how above we linked to the other blog post on page speed? That’s a great example of internal linking within text- you can hyperlink to other pages on your website that you’d like to highlight and direct the user to. Another example is the navigation bar at the top of the screen, which links to other pages on the website. It’s helpful for users because it helps them to better navigate the website because it establishes a clear information architecture. The reason this helps your organic rankings is because it helps Google to easily crawl your website, find and assess every page and it signifies that a page is important. When Google ranks pages, it looks closely at the content relevancy as well as the relevancy of internal links and the pages they lead to in relation to the search query. The higher the relevancy of internal links and page content, the higher the page rank. Want to know more about internal linking? Click here. Why are internal links good for you and your dealership? Other than helping your page show up higher in the SERP, linking to other, high-converting content helps to increase a user’s time on your site, increases product awareness and increases conversion rates. All of these things contribute to lead generation – the end goal! Thanks for joining us this week! Tune in next episode for more ways to help improve your organic ranking! Follow us on Instagram, like us on Facebook and come chat to us, we’d love to hear from you! Want to know how our Organic Search team can help you get onto the first page of Google? Chat with us and we’ll work together to win you that spot!